If you’re reading this magazine, you might be the kind of person who has thought about writing a screenplay or a novel. And if you’re anything like me, you might have begun that process by loading up an Amazon cart with writing guides, hoping for wisdom and direction. If you’ve turned to story structure gurus like Syd Field or Christopher Vogler or Robert McKee, you’ll quickly find that there is a real reverencefor the three-act structure (in whatever formulation the author in question prefers). To screenwriting gurus, the movie is the story, and the story is the structure—often with an almost Chomskyan insistence that humans are hardwired to respond to the three-act plot. Aspiring screenwriters are made to understand that if they don’t get story structure, they’re at risk not only of not selling their screenplays, but also of misapprehending an essential truth about human nature. Three-act structure, as preached by writing gurus, somehow ends up seeming like a religion and a recipe at the same time; it makes stories mean both too much and too little. If you make sure your inciting incident is a call to adventure, if you build your characters from intriguing archetypes, you might just be in tune with the monomyth—the story that undergirds all stories. Also, you might just be able to hook a producer in those all-important first ten pages. It’s at once mythical and mercenary, a hegemony that means that every screenplay can partake of the Great Story, but also that every screenplay must stretch itself over the same frame. I don’t mean to begin with any sort of hostility toward narrative structure as such; I have no antipathy toward the Hero’s Journey or the three-act structure or any other narrative features of classical Hollywood cinema. They’re useful paradigms, both for creation and criticism, and they’ve resulted in moving, enduring works—Pixar, for example, has consistently executed the arch plot with aplomb. But story structure devotees often talk in terms of the “key” or the “secret” or the “special sauce” to screenwriting, suggesting stories can be engineered in a laboratory to be maximally entertaining, maximally meaningful, to press all of the buttons that people go to the movies to have pressed. And good stories can be engineered that way, no doubt. But I’m suspicious of the idea that they ought to be—that films have a kind of cosmic obligation to guide us through some Great Arc, or even to entertain us at all. I’m not alone in that, of course; film theorists have long argued that cinema can do much more than tell stories. Any fans of art filmmakers like Antonioni, Tarkovsky, Kiarostami, or Wong Kar-Wai have to develop an understanding of film that allows for unusual approaches to narrative. But definitions of an art film can sometimes play into the same ideas that screenwriting gurus espouse: that we’re naturally wired to enjoy a certain kind of story, and anything different is going to be an acquired taste. You can learn to like Bergman or Malick just like you can learn to like wine or coffee, but developing that taste will require some effort. Films without a familiar three-act story structure are commonly understood to be a sophisticated, distinctly adult pleasure, and cinephiles like to congratulate themselves for having learned to enjoy them. And so children’s films are almost universally written to conform to the popular narrative formula, a hero’s journey with escalating stakes and a villain and a climax. Children, the thinking seems to go, can’t be expected to sit for anything less than a conventional three-act plot, lest they grow restless and confused. But this line of thinking misses the fact that young children haven’t seen any movies yet, aside from the ones that adults have shown them. They don’t know the conventions unless they’ve learned them; they don’t know how a movie is “supposed” to go. They’ll very quickly pick it up, if they consume an average media diet, but very young children are famously omnivorous; they eat fruit and vegetables, chips and candy, paste and paper. There are those who believe the arch plot is written into the human heart itself, and that children crave it for that reason, but I’m skeptical. Among other reasons, I’m skeptical because of My Neighbor Totoro. 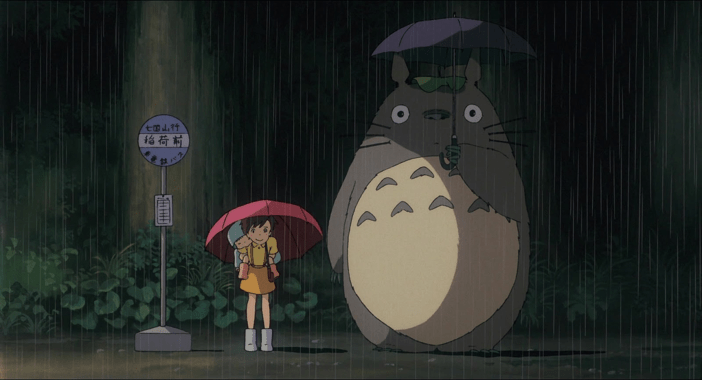 Hayao Miyazaki’s 1988 film and its titular character are iconic; Totoro is as well-known and beloved in Japan as Winnie the Pooh is in the US. I don’t have metrics on how many American children grew up with the film (it never had a US theatrical run, but it was released in English on VHS in 1993 and DVD in 2006), but Miyazaki is a household name by now, thanks to Disney’s distribution. Everyone I know who encountered My Neighbor Totoro as a kid speaks about it with a special tenderness now. Reminiscences about the film tend to fall into a soft, warm vocal register, one usually reserved for discussing private, real-world childhood memories—half-forgotten vacations, first encounters with nature, old old friends whose photos lie in shoeboxes in the back of the closet. If a parent asks for film recommendations for young children, Totoro is my go-to, every time. 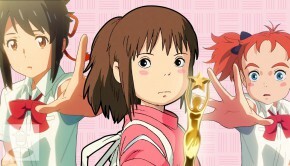 About a year ago, I recommended it to my friends with two young daughters, and they’ve since torn through Miyazaki’s works, wearing out copies of Kiki’s Delivery Service and Howl’s Moving Castle and Ponyo. So what happens in My Neighbor Totoro, this singularly entrancing film? Two young girls, Satsuki (maybe 8 years old) and Mei (maybe 4), move into an old house in the Japanese countryside with their father sometime in the 1950s. There’s much discussion of the house being “haunted,” but the nobody seems particularly worried about this. (When Satsuki tells her dad there’s something weird in the house, he responds, “That’s great, I’ve always wanted to live in a haunted house!”) Satsuki, Mei, and Dad get to know their neighbors. They do chores and make meals. They take bike rides to the hospital to visit the girls’ mother, who remains in good spirits despite her (unspecified) condition. 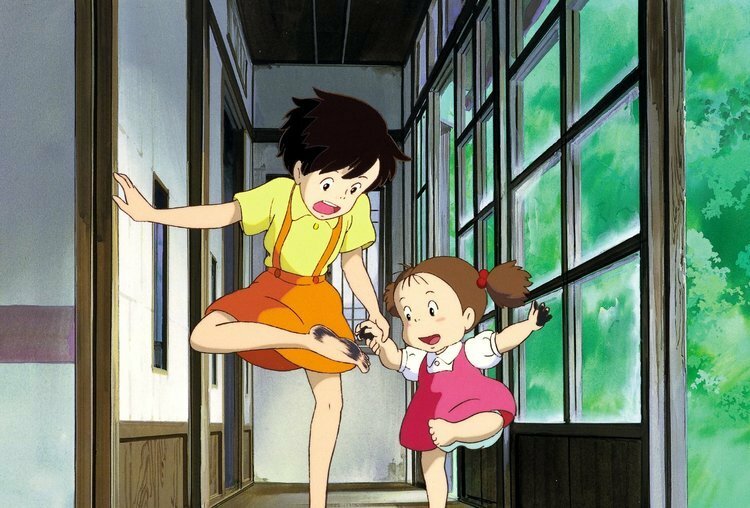 Satsuki and Mei spend most of the film in an exploratory mode, scampering around their house and neighborhood. They have mysterious but friendly encounters in the forest near their house with creatures that they call “Totoros”—a mispronunciation of “tororo,” the Japanese word for troll. The story is made up of a series of incidents or episodes, almost none of which I’d classify as a plot point, per se. The only truly tense moment comes late in the film, when Mei runs off to the hospital by herself, worried her mother is in danger. This turns out to have been a false alarm, and everyone is soon reunited. The whole thing is resolutely low-stakes and gentle, its narrative lumpy and relaxed. And children love it. They love it. My sisters and I watched it ad nauseam growing up, and every child to whom we’ve passed it on has done the same. We didn’t know it was characterized by “narrative intransitivity,” one of Peter Wollen’s diagnostic criteria for avant-garde counter-cinema. We just knew it was wonderful. Current children’s cinema is composed predominately of flashy adventure-comedies (to name some recent hits: The Lego Batman Movie, Finding Dory, The Secret Life of Pets, Zootopia). Structurally and tonally, they feel almost exactly like blockbusters made for adults, minus any potentially offensive content. They aren’t so much made for children as they’re made to be not not for children. Perhaps this is why the genre is generally called “Family,’ rather than “Children’s.” The films are designed to be pleasant enough to a broad, age-diverse audience, but they’re not necessarily made specifically for young hearts and brains. My Neighbor Totoro is a genuine children’s film, attuned to child psychology. 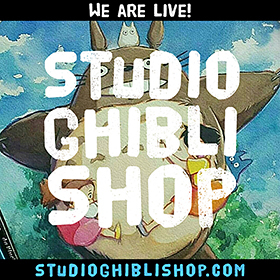 Satsuki and Mei move and speak like children: they run and romp, giggle and yell. The sibling dynamic is sensitively rendered: Satsuki is eager to impress her parents but sometimes succumbs to silliness, while Mei is Satsuki’s shadow and echo (with an independent streak). But perhaps most uniquely, My Neighbor Totoro follows children’s goals and concerns. Its protagonists aren’t given a mission or a call to adventure—in the absence of a larger drama, they create their own, as children in stable environments do. They play. Consider the sequence just before Mei first encounters Totoro. Satsuki has left for school, and Dad is working from home, so Mei dons a hat and a shoulder bag and tells her father that she’s “off to run some errands.” The film is hers for the next ten minutes, with very little dialogue. She’s seized by ideas, and then abandons them; her goals switch from moment to moment. First she wants to play “flower shop” with her dad, but then she becomes distracted by a pool full of tadpoles. Then, of course, she needs a bucket to catch tadpoles in—but the bucket has a hole in it. And on it goes, but we’re never bored, because Mei is never bored. It isn’t that My Neighbor Totoro is an entirely happy, sedate film minute-by-minute; Satsuki and Mei experience moments of fear and anger and sadness. But they experience the range of human emotions on a child’s scale. They’re frightened of the susurrating susuwatari (“soot sprites”) haunting their house until their father tells them it’s okay not to be. Mei has separation anxiety while being babysat and demands to be taken to Satsuki’s school. The girls worry about their father when they have to wait for a bus for longer than they expected. Each of these episodes has its own kind of suspense and sustains interest, but the music cues reassure us that all will ultimately be well. There is a popular notion that children are easily bored, and I think a horror of boredom has probably driven children’s entertainment further into the realm of the whiz-bang. Weary parents, longing for a moment of peace, want to trust that a movie will be able to fully occupy their children for 90 minutes. And if the goal is merely to stop the motion and chatter for a moment, high-stimulus distraction is a powerful tool. Many children’s films and shows operate on this principle—fast-paced, loud, and colorful, they’re a like a benign thrill ride you can strap into and let go. But I think some of the common thinking about children’s boredom and attention is inaccurate. Children are bored standing in line at the bank or the post office, certainly—they have no banking of their own to do, no mail of their own to send. But if you were to put a child and an adult in an empty room full of scattered objects, I suspect the adult would grow bored much faster. For children—who lack jobs and smartphones and complex worries about relationships—the days are long. They therefore have to develop ways to be interested in the fact of being alive, for its own sake. Children can stay at parks and playgrounds for hours, inventing games and stories for themselves, finding new challenges for their bodies. They’ll play with rocks and sticks, and they’re happy to play the same games over and over again. Most children have a natural skill for what adults call “mindfulness”—the kind of unselfconscious attention to the present moment that most adults can only achieve by means of exercise or meditation. Being continuously interested in a film like My Neighbor Totoro requires this kind of childlike mindfulness. It’s less like a ride you can strap into and more like a place you can go. This gets at an important factor for a great children’s film: rewatch value. You can only ride a ride so many times before the thrill wears off. But a child can never exhaust the possibilities of a park or a neighborhood or a forest, and Totoro exists in this mode. The film is made up of travel and transit and exploration, set against lush, evocative landscapes that seem to extend far beyond the frame. We enter the film driving along a dirt road past houses and rice paddies; we follow Mei as she clambers through a thicket and into the forest; we walk home from school with the girls, ducking into a shrine to take shelter from the rain; we run past endless green fields with Satsuki as she searches for Mei. The psychic center of Totoro’s world is an impossibly giant camphor tree covered in moss. The girls climb over it, bow to it as a forest-guardian, and at one point fly high above it, with the help of Totoro. Much like Totoro himself, the tree is enormous and initially intimidating, but ultimately a source of shelter and inspiration. My Neighbor Totoro has a story, but it’s the kind of story that a child might make up, or that a parent might tell as a bedtime story, prodded along by the refrain, “And then what happened?” This kind of whimsicality is actually baked into Miyazaki’s process: he likes to begin animating his films before they’re fully written. Totoro has chase scenes and fantastical creatures, but these are flights of fancy rooted in a familiar world. Lots of being a kid is watching and waiting, and Totoro understands this. When Mei catches a glimpse of a small Totoro running under her house, she crouches down and stares into the gap, waiting. Miyazaki holds on this image: we wait with her. Magical things happen, but most of life happens in between those things—and this has a kind of gentle magic of its own. When Roger Ebert asked Miyazaki about the “gratuitous motion” in his films—the bits of realist texture, like sighs and gestures—Miyazaki told Ebert that he was invoking the Japanese concept of “ma.” Miyazaki clapped three times, and then said, “The time in between my clapping is ma.” This calls to mind the concept of temps morts, or dead time, in the European art cinema of the 1950’s. Temps morts is a pause, a beat, a breath, a moment that doesn’t advance the plot; the device forces viewers to settle into the rhythm of a film. The very term “temps morts” almost carries a judgment in it (at least in translation), as if to imply that a film is more “alive” when it is telling a story. But Miyazaki’s moments of “ma” are full of life—there is a simple joy in watching his worlds move. In “animating” (both literally and in the sense of “bringing to life”) a world that looks like our own, Miyazaki carries forward a spirit from the very beginning of film history. ’We will see… landscapes,’ they announced, ‘in which the trees bow to the whims of the wind, the leaves ripple and glitter in the rays of the sun.’ Along with the familiar photographic leitmotif of the leaves, such kindred subjects as undulating waves, moving clouds, and changing facial expressions ranked high in early prophesies. All of them conveyed the longing for an instrument which would capture the slightest incidents of the world about us. In the 20th century, film quickly grew into a storytelling medium, a development that Metz says “was by no means predestined—nor was it strictly fortuitous.” Film evolved into narrativity—but in the process, perhaps it lost some of its power to draw our attention to the wind and the leaves. There is, then, an “ontogeny recapitulates phylogeny” point to be made about film history. Before we decided film should tell stories, we were content with Lumière brothers’ slices-of-life and Méliès’ magic tricks, with trains and “happenings,” with the miracle that pictures were moving at all. Young children, too, are at a protocinematic stage of development: they enjoy picture books and nonsense nursery rhymes, improvisational dance, scribbling with crayons, and other repetitive, relatively drama-free, narrative-free, content-free entertainments. They are attracted to cinema for its motion and its color and, for lack of a better word, its “magic.” Uncorrupted by exposure to more sophisticated entertainments, they ask no more of moving pictures than that they be what they are. As cinema grew up and learned to talk in the 1930s, it developed more rules and conventions (for grouching about which, see Arnheim). And as children grow, they learn how a movie is “supposed” to go; they internalize the beats of the structure. Most people spend the rest of their lives watching a type of film they were taught to enjoy in their childhood. Those who venture into the world of international film, art film, and counter-cinema may find that it’s not just about developing a taste for the slow or unusual, or getting out ahead of our desire for traditional narrative—it’s about returning back to our cinematic state of nature. Perhaps our mistake is in wanting to use films, to have them cater to us and keep us from boredom, rather than to see them, love them, and respect them as the free, precious, ephemeral things that they are. All this may make it sound like I’m making an “eat your vegetables” argument for watching My Neighbor Totoro. It’s true that I do think that most children’s entertainment has been pumped with a kind of spiritual and aesthetic corn syrup, in a desperate effort to make it go down easy. I just think that the desperation is unnecessary, and has resulted in a sort of “Dorito effect” in children’s media: louder, faster, higher-stimulus entertainment is addictive, and has the tendency to crowd out quieter pleasures. But I do realize how insufferable it is for someone like me, who does not have children, to speak prescriptively about matters of parenting. Watching My Neighbor Totoro is not eating your vegetables—if anything, it’s more like eating a basket of perfect, small, ripe strawberries fresh from the farmer’s market. 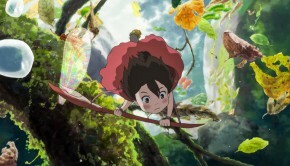 I think the best sorts of children’s entertainments are nutritious, but still sweet: The Red Balloon, Winnie the Pooh, Mr. Roger’s Neighborhood, Sesame Street, The Muppet Movie, and Miyazaki’s other films for young people (particularly Kiki’s Delivery Service and Ponyo). 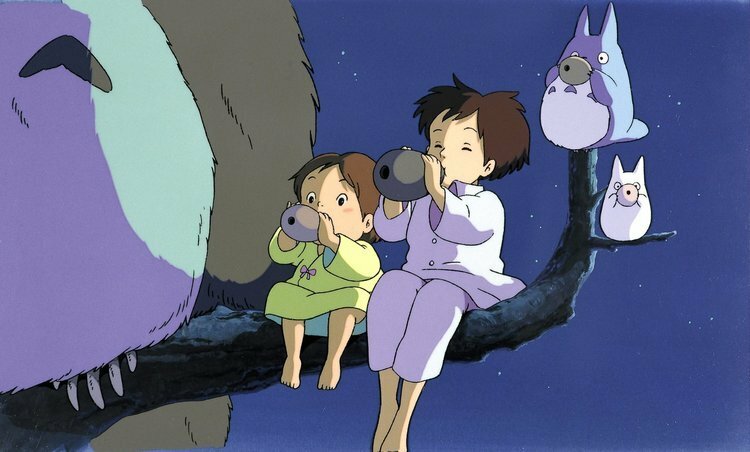 Ebert’s 1993 review of My Neighbor Totoro opens with this line: “Here is a children’s film made for the world we should live in, rather than the one we occupy.” I tripped over this the first time I read it. I instinctively recoil from art that depicts an idealized world; it reminds me of Sunday school and Thomas Kinkade, and sets me trying to sniff out hypocrisy. 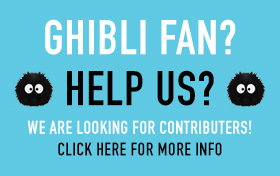 With respect, I think I’d revise Ebert’s sentence: My Neighbor Totoro is a children’s film for the world as it is, and for the world as it should be. I’ll furnish an example. 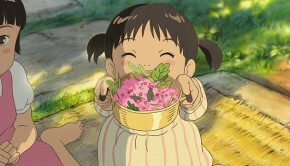 At one point in the film, Satsuki and Mei have planted seeds, and are disappointed that they haven’t started growing yet. One night, they are surprised and delighted to find that the Totoros are out in their garden, doing a magic dance to make the seeds grow. Satsuki and Mei join them, and soon enough an enormous camphor tree is exploding out of the garden. The Totoros take the girls flying high into the tree top, and they spend the night playing music on the highest branches. The next morning, the girls go out to look at the garden, and find that the tree is gone—but the seeds have sprouted. Rather than second guess their magical night, they break out into a jubilant dance—what matters is that their garden is growing. That’s magic enough. And I can remember how that giant camphor tree haunted my imagination as a child, and how I hoped that heaven would look something like Totoro’s forest. I remember how Mei first met the giant Totoro—innocently, awkwardly climbing onto the belly of this unknown beast, but somehow sensing in the cadence and rumble of his powerful breath that he was good. As I watched Mei’s delicate physical and emotional arc over the scene—she goes from giggling delight to apprehension to full-throated roaring to, at last, a deep and peaceful sleep—I could feel love emanating from the frame. 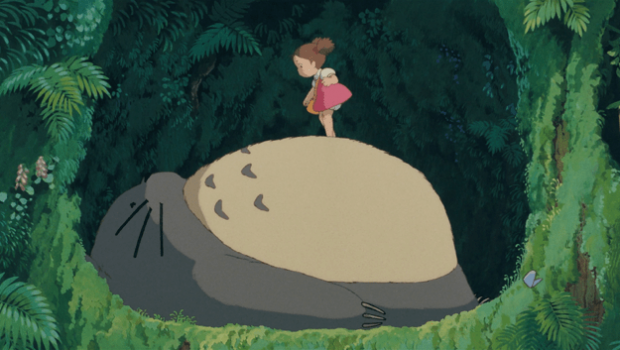 Love for Totoro, love for Mei, love for the forest, love for the viewer. In not betraying the essence of things, in allowing them first of all to exist for their own sakes, freely; it is in loving them in their singular individuality. ‘My little sister reality,’ says De Sica, and she circles about him like the birds around Saint Francis. Others put her in a cage or teach her to talk, but De Sica talks with her and it is the true language of reality that we hear, the word that cannot be denied, that only love can utter. 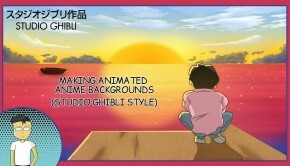 There is an irony in applying a Bazinian approach to Miyazaki, though. Bazin loved the way that features of the real world showed up in De Sica’s frames; he loved what De Sica allowed to happen, often by chance. But in an animated film, nothing happens by chance—every moment of apparent “realism” or spontaneity or happenstance in an Miyazaki film arrives there through hours of painstaking drawing and painting. De Sica shows his affection for the real world by allowing reality to sneak into the boundaries of the frame. Miyazaki consecrates the real world—the real world of children, in particular—by drawing it into existence. Miyazaki stands before the field, and loves each blade of grass into the frame.